A powerful earthquake of magnitude 8.8 (later upgraded to 8.9) occurred near east coast of Honshu, Japan at 0546Z (1446 hours local time of Japan) on March 11, 2011 at 38.3 North, 142.4 East at a depth of 24 km. Within 40 minutes, three more earthquakes of magnitude 7.0 or higher, struck in succession in the Pacific near northeastern and central Japan. Earthquake has caused damage to the buildings followed by fire and power failure. Loss of life is to be ascertained. 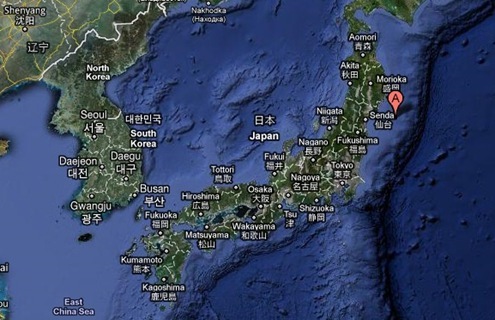 Also, this earthquake has triggered a massive tsunami to strike Japan. At 1521 hours tsunami of more than 4 meters high, struck Kamaishi and Miyako in Iwate Prefecture. At 1550 hours a tsunami surging higher than 7.3 meters struck Soma Port in Fukushima Prefecture, sweeping away houses. At 1652 hours a 4.2 meter tsunami hit Oarai in Ibaraki Prefecture. Tsunami warning is also issued to areas within and bordering the Pacific Ocean and adjacent seas, except Alaska, British Columbia, Washington, Oregon and California. View a video clip from You Tube: Massive Quake Triggers Tsunami in Japan. Read more from, NHK World. Tsunami impact is minimal to U.S. Pacific Fleet. View some photographs of Tsunami ravaged Japan from Tollywood Blog. Tsunami affected Japan declares Nuclear Emergency. Read more from International Atomic Energy Agency.